I’m very pleased to announce that the 12th issue of Into the Ruins is shipping to subscribers and is now available for purchase! This Spring 2019 issue runs 112 pages, featuring five great new stories, an Editor’s Introduction, and another great letters to the editor section with plenty of interesting insights, considerations, and reflections on a variety of topics. Two horror-tinged offerings from Daniel Stride and Daniel Soule—the former with a story of a forest with a thirst for human blood and the latter with one of rationalism run amok—and an adventurous tale of a special kind of magic from Clint Spivey help round out this issue. Those five tales coupled with an excellent and eclectic letters section closes out the third year of Into the Ruins on a high note. Subscribers will be receiving their copies in the coming days, with a number of you having received delivery already. Those of you who aren’t subscribers but would like a copy of the new issue can order a copy here from our store, which will ship immediately. The issue is also available from Amazon or you can purchase a digital edition of the issue at Payhip. For international readers, you can go to the issue page for links to international Amazon sites it’s available through, or reply to this email for options to purchase directly for international delivery. If you aren’t already a subscriber, consider signing up! Already are a subscriber? Well, this is the end of Year Three. That means two things. First, a new Year Three package is available for purchase, consisting of issues #9-12 of the magazine. Second, it means the majority (though not all) of subscriptions are up for renewal. So renew today! The consistent support provided by subscriptions is critical to the success of Into the Ruins, and I want to go into Year Four just as strong as I went into Year Three. So please up your subscription for another year and keep the magazine on excellent footing. Aren’t sure if your subscription has ended? Shoot me an email and I’ll let you know where you stand. Finally, the sharp-eyed amongst you have surely noticed that the name of this issue, Spring 2019, falls out of order with the naming convention up to this point. Where did Winter 2019 go? Well, you can find that info both in the pages of the new issue (page 11, to be exact) or on the website blog here. As always, I encourage readers to send their thoughts and feedback to me at editor@intotheruins.com, both as casual emails (rambling acceptable!) and as official letters to the editor that I can consider for publication in the 13th issue of Into the Ruins, scheduled for publication in June. In particular, I would love to continue receiving thoughts and feedback on Hannes Rollins’ essay from the Summer 2018 issue on magic, religion, and superstition in deindustrial science fiction, as well as the letter responses found in both the Fall 2018 issue and this new one–as well as anything else touching upon the contents and theme of the magazine. Comments for contributing authors, as well, will be happily forwarded on. Now go read the new issue and enjoy some fantastic deindustrial and post-peak science fiction! Rest assured, dear readers, I know what you’re thinking as you read of the new Spring 2019 issue of Into the Ruins being released. “Where the heck,” you’re wondering, “did the Winter 2019 issue go?” It’s a fine question—perceptive, insightful, speaking well of you—and one I’m all too happy to answer. It’s coming. In about nine months. Yes, I’ve taken the opportunity to alter the naming convention of the magazine. When I first launched Into the Ruins, I intended to release issues on or near the equinoxes and solstices, with the plan of naming the magazine after the season being ushered in by those astronomical events. Unfortunately, my ambitions exceeded reality and the first issue of the magazine launched in late April of 2016, about a month behind schedule. By the third issue I was a month and a half behind schedule and then two months behind by the fourth. For the most part it did not get better from there, and by the time I suffered technology-related delays with the eleventh issue, my release cycle had come to be a full season behind, with the Fall 2018 issue releasing just days before the Winter 2018 solstice—and subscribers not receiving their copies until the new year. On a related note, my original schedule for the magazine would have seen the fourth issue releasing in mid-December of 2016 and thus being titled Winter 2016. Due to it slipping into 2017, I took the opportunity presented by the fact that winters cross calendar years and simply named it Winter 2017 instead. Yet, that always bothered me. After all, it’s the wrong name; winter is traditionally assigned to the year it starts in, not the year it ends in. Thus, a solution is born. Seeing as I’ve slipped behind schedule enough to come back into alignment with the seasonal transitions, I’m taking the opportunity to properly assign this new issue the name of the season it’s releasing into, Spring 2019, and am going to move the Winter 2019 issue forward to where it belongs: in December 2019, as the title of the fifteenth issue of Into the Ruins. With luck, this will create minimal confusion, better align the magazine titles with the actual season of their release, help motivate me to stay on track with the schedule, and soothe my Virgo mind. And of course, for all you subscribers out there, this change in naming will have no impact on the number of issues you receive for a year’s subscription. You still will receive four issues, even if the seasons named become a little wonky for the year. As always, thanks to all of you for your ongoing support, and here’s to a great Year Four! First off, I have some good news. The new issue of Into the Ruins is almost here! That’s right, Issue #12 should be releasing within the next week or so and arriving in the mailbox of subscribers not long after that. This is going to be a fun one, featuring both the longest and shortest stories ever published in the magazine–and will feature part one of the first serialized story published in the magazine. Want a sneak peek? Scroll down for a glimpse of the cover. I’ll be making an official announcement of the release soon, along with the customary links to purchase copies and an update on when subscribers should expect to see their copies. But I wanted to take a moment to talk about a few relevant things prior to this release. First of all, as always, I would love it if subscribers could be sure to update me with any changes in your address. I don’t want your newest issue of the magazine disappearing into the ether! So shoot me an email with any updates. Second, the release of this issue officially marks the end of Year Three. It’s kind of amazing, I have to say; time goes fast! I didn’t necessarily think I wouldn’t get to this point when I started the magazine, but I had no idea if the magazine would be successful or not. Turns out, it has been, thanks to all of you who have supported it. (Thank you so much!) It feels like an accomplishment to have three years of releases under my belt, and to have mostly stuck to the quarterly schedule the entire time. Speaking of which, it’s time for many of you to renew your subscriptions! As I’ve noted before, the majority of subscribers are on the same yearly cycle of the magazine. As we close out Year Three and get ready to jump into Year Four, that means it’s time for many of you to resubscribe. Granted, not all of you; if you aren’t sure if your subscription has expired or not, send me an email and I’ll let you know. I’ll be sending out reminder emails to individuals soon, too. But know it’s time and want to re-up now? Great! Your support is huge. Go to https://intotheruins.com/renew for instructions on how to renew by mail or online. Finally, speaking of sticking to the quarterly schedule, that’s not entirely true. It has slipped a little over the years and the sharp-eyed amongst you probably noticed that with this new issue, I went right from Fall 2018 to Spring 2019. Where did Winter 2019 go? Well, I’ll be answering that in a future blog post, as well as in the pages of the new issue. Stay tuned. I hope you’re enjoying the newest issue of Into the Ruins, which should have arrived for all subscribers by now (except Australian subscribers–it’s on the way!). Haven’t received it yet? Get in touch, and we’ll figure it out. Perhaps you just need to renew your subscription, or maybe just subscribe in the first place if you haven’t already! Specific thoughts on this issue, the stories within, and the issues raised in the letters section. This includes letters to the editor to be considered for publication in the next issue. If your response is in that vein, please note that you would like it considered as a letter to the editor and I’ll act accordingly. Thoughts on what types of stories published in Into the Ruins you like, which ones you don’t, and what you are looking for more or less of. What kind of editorial (non-fiction) content you would like to see in the magazine, whether it be in line with what has been included before or something new. Your overall impressions of the magazine, both positive and negative. And perhaps most important, if you are a former subscriber whose subscription has lapsed, why haven’t you renewed? If you haven’t subscribed, why not? And if you have yet to take the plunge and purchase any issues of the magazine, why is that? While I receive feedback on the magazine relatively often, I am always interested in more. Sometimes it takes a direct request to get that–so here it is. Please let me know what you think. I really want to know, and I want this magazine to do well, including by both retaining subscribers and bringing in new ones. Knowing why people subscribe, why they don’t, and what may convince them to do so helps me, so please send in your feedback, whatever it is. Finally, one last quick reminder: Our Winter Sale is on, but it won’t be around forever. The sale ends February 10th. So get on it if you want to pick up some back issues at a discount and take advantage of free shipping in the U.S. Just as a reminder, all back issues (#1-10) are all just $10 each (discounted from $12) and all orders ship free in the U.S. Not in America and want to order copies? Get in touch, tell me where you are in the world, and I’ll let you know what options there are. That’s it. As I said, I hope all of you who have received the new issue are enjoying it, and thank you all for your support of this project. It wouldn’t exist without you. And I’m glad it exists. So thank you. Into the Ruins: Fall 2018 (Issue #11) is Now Available — and Winter Sale Expanded! I’m very pleased to announce that the eleventh issue of Into the Ruins is finally shipping to subscribers and is now available for purchase! I apologize for the delay on this one; a forced transfer to a new setup and printing program (I may be writing more about this later) really added some delays to things and proved very frustrating at times. The good news, though, is that this is a great issue despite those troubles! 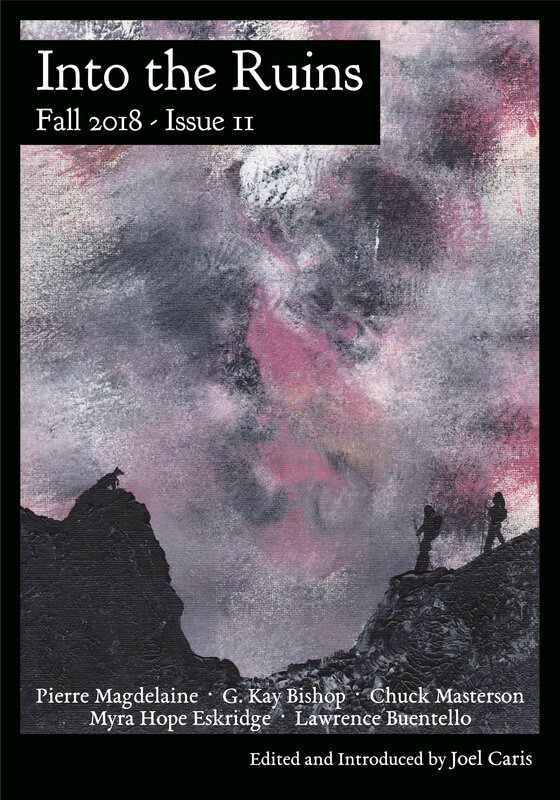 This Fall 2018 issue runs 106 pages, featuring five great new stories, an Editor’s Introduction, and a thoughtful and insightful letters to the editor section with plenty of great musings on the role of magic and religion in deindustrial science fiction. 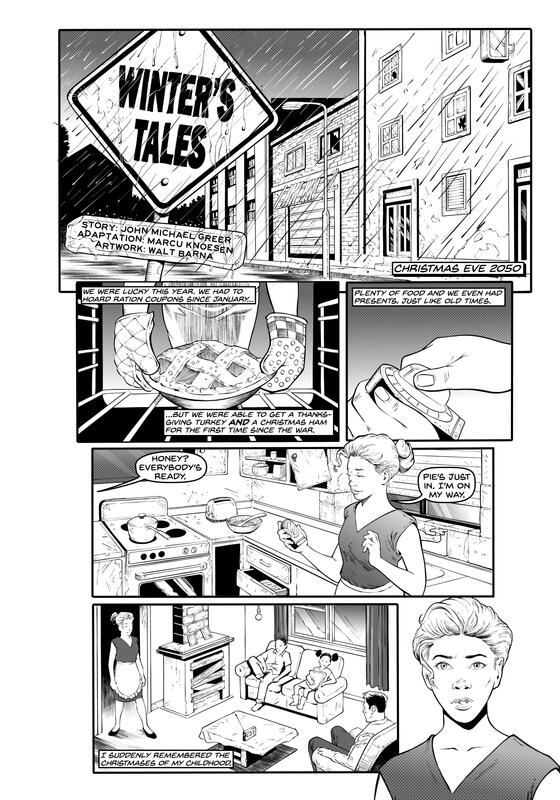 Compelling stories of our deindustrial future abound in this new issue of Into the Ruins. From literal castle intrigue to a hopeless girl’s solitary friend, from the lively bustle of a Boston partly swamped by the seas to the solitary horse riders of a far future California. And on to the constant flexibility of language and the unending role of stories in how we make sense of the world—these are the foundations of the tales that await you. Along with another fascinating and thought-provoking letters section, these tales promise plenty of good reading and fodder for ruminations on what our deindustrial future holds in store for us. Subscribers will be receiving their copies by the middle of the month (and some of you may have received yours today, even). Those of you who aren’t subscribers but would like a copy of the new issue can order a copy here from our store, which will ship by January 20th or sooner. The issue is also available from Amazon or you can purchase a digital edition of the issue at Payhip. For international readers, you can go to the issue page for links to international Amazon sites it’s available through, or reply to this email for options to purchase directly from us for international delivery. If you aren’t already a subscriber, consider signing up! The consistent support provided by subscriptions is critical to the success of Into the Ruins. Haven’t renewed your subscription and not receiving the newest issues? Please re-join us! Your support is huge. As always, I encourage readers to send their thoughts and feedback to me at editor@intotheruins.com, both as casual emails (rambling acceptable!) and as official letters to the editor that I can consider for publication in the twelfth issue of Into the Ruins, scheduled for publication in March. In particular, I would love to continue receiving thoughts and feedback on Hannes Rollins’ essay from the Summer 2018 issue on magic, religion, and superstition in deindustrial science fiction, as well as the letter responses found in this new Fall 2018 issue. Comments for contributing authors, as well, will be happily forwarded on. Now go read the new issue and pick up some back issues and enjoy some fantastic deindustrial and post-peak science fiction! What’s the Role of Magic and Religion in Deindustrial Science Fiction? One of the key challenges in writing good deindustrial science fiction, to my mind, is how to inhabit the cultural mind of a future civilization utterly unlike our own. This isn’t always a challenge, of course, because great deindustrial science fiction doesn’t have to be set in a future civilization; it can be set in the waning days of our own, a place we inhabit now and will continue to inhabit for years to come. However, as our civilization declines and fades over the coming century or two, new civilizations will inevitable emerge out of the ruins of our own, and what those might look like and how they may understand the world is some pretty fascinating grist for the imaginative wheel. The types of stories that can come out of such grist are exactly what I wish to publish in Into the Ruins. However, a conundrum inevitably arises: I want such stories of future cultures to be realistic in that they depict a culture with radically different views from our own, but trying to imagine what those views might be without succumbing to the frames of reference enforced by our own culture is incredibly challenging. Furthermore, imagining what kinds of technologies, religious beliefs, occult practices, cultural myths and narratives, and methods of exploring and understanding the world may be found in a future culture utterly different than our own—and what of those is realistic to the degree we can determine that—is all the more challenging. I think of this as a catch-22. One of the rules I have for submissions is that they must be realistic based on what we know of the physical world and how it functions. This is a crucial rule, as it helps to head off many standard science fiction tropes, such as the discovery of limitless amounts of clean energy, or of continued exponential growth despite the physical limits of our planet. It’s one of the key guidelines in seeking out realistic stories of the futures that factor in and deal with the hard realities of climate change, resource and energy depletion, ecological destruction, and political and economic dysfunction. But what of the futures that, to our current understanding of the world, sound superstitious at best, insane at worst, but that may be completely feasible within a radically different cultural frame of reference? There are inevitably myriad types of technologies that could conceivably work within our world, following the rules of physics as we understand them, and could be hugely useful—but that we would never imagine due to our culture’s particular habits of thoughts and focuses of scientific inquiry and discovery. Further, the limited scientific materialist worldview so dominant in our current culture that claims that only those things that can be measured by our current instruments of measurement are real, and that all other things are not—or are superstition, or nonsense, or the failure of rational thought—undoubtedly cuts off consideration and discovery and use of very real phenomena that is dismissed out of hand simply because it doesn’t conform to our particular cultural expectations. [Hannes Rollins] asked [me] what the policy was on magic in Into the Ruins, to which I responded that I honestly was not sure. As I am open to the idea of a mysterious, even magic universe, I do not want to eliminate it entirely. And certainly, I heartily encourage a preponderance of magic and religion in the cultures of the future written about in the magazine, as those elements will play a role in future cultures just as commonly as they have played a role in past ones. The question, then, is not so much the belief in these in future cultures, or in the portrayal of behavior and practices structured around those beliefs, but in the question of if manifestations of those beliefs in the physical world should be allowed—or if such manifestations would violate natural laws as we currently understand them. Many people today, of course, would argue that they would, though claims of such occurrences go as far back as we have records and memory. I believe the case is not nearly so clear-cut, as just because the scientific method has so far provided no way of explaining a variety of phenomena experienced by humans throughout the world does not mean that such phenomena doesn’t exist. On the other hand, my casual readings of [John Michael] Greer, combined with my own beliefs about the world, are enough to convince me that any real-world manifestations found in the practice of magic are limited in a wide variety of ways; Harry Potter, in other words, is not an accurate guide to real world magic—nor is most any other representation of magic in popular culture. If a practicing mage edited and published Into the Ruins, perhaps she would have an easier time grappling with this question. I, however, am not one; my interest in magic has never really passed the curiosity stage and is limited to reading what other people with actual experience actually think. So what is possible and what is not, what is realistic and what is not: that is not something I feel qualified to judge at the moment. So again, we are left with the question of what is the appropriate place of magic in deindustrial science fiction? I have no clear answer to that question. But I believe it’s one worth grappling with. For those of you subscribers and purchasers of the magazine who have yet to read Mr. Rollins’ essay, or my own letter, I encourage you to do so. And I ask the same question I did in the most recent issue: What do you think should be the role of magic and religion in deindustrial science fiction, and how do we navigate those complex and in many ways foreign concepts in a culture that so utterly disavows them? I want your thoughts. I want a conversation in the letters to the editor section of the magazine, or longer response essays to my letter and Hannes’ essay. Therefore, I invite any and all readers to make their own attempts at grappling with the above question in letters to the editors or essays of any length, submitted to me at editor@intotheruins.com or via a comment on this blog post. Your thoughts may just end up in a future issue of the magazine—and may just spark a future great work of deindustrial science fiction. Let’s hear it. And thank you. P.S. Don’t miss our Fall Sale going on right now for a limited time! All back issues (#1-9) are just $10 each and ALL orders ship FREE in the U.S. Take advantage today! FALL SALE! All Back Issues $10 Each, Plus Free U.S. Shipping! Over the last month or so, the approach of fall has made itself very known here in the Pacific Northwest. I don’t know if I’m quite ready–although as the leaves begin to change, the rain finally returns, and the nights cool off, I’m getting more and more excited about it–but if there’s one thing that’s appropriate in fall, it’s reading. And so, in celebration of the changing season, I’ve put all back issues of Into the Ruins on sale. That’s right, all nine back issues of the magazine are now available for just $10 each! (The new tenth issue is available for the regular price of $12.) In addition to the discounted price, FREE shipping is available on all U.S. orders, as well, no matter how many issues you purchase. Sound like a good deal? Great! You can get these special discounts on our Special Deals page. Grab as many issues as you want. Stock up, complete your collection, grab some gifts, or just spread them around town. This is a limited time deal (though how limited, I haven’t yet decided) so get cracking and help me clear out some inventory. Into the Ruins: Summer 2018 (Issue #10) is Now Available! A bit of a belated announcement here, but I’m very pleased to announce that the tenth issue of Into the Ruins is now available for purchase! (And subscribers have already received their copies—unless, of course, you haven’t renewed.) Getting this issue put to bed and out to the public has been a bit of work, dovetailing with some own personal delays, but I’m really happy for this one to see the light of day. I think it’s worth the wait, and hopefully everyone who reads it will agree. There’s some really fun stuff in this issue. This Summer 2018 issue runs 108 pages, featuring five great new stories (one a fun surprise I’m about to spoil), an Editor’s Introduction, a short-but-great letters to the editor section, and a guest essay that really excites me. This issue brings with it surprises, new adventures, and at least one familiar landscape—all brought to us by writers old and new. Alistair Herbert returns one more time to the world of “The Change Year” and “Archive” to bring his triptych of the future to a close. Brian Koukol weaves us a delightful tale of the future in which the old world is brought back to life in a surprising way. Chloe Woods takes us to a light house at the edge of the sea and the dangerous visitors who come knocking, while Kyle E. Miller shows us a locked and frozen land of winter. Finally, in an exciting first for this magazine, John Michael Greer’s stellar deindustrial science fiction story, “Winter’s Tales,” is brought to vivid, visual life in comic form by Marcu Knoesen and Walt Barna–and I have to say, I’m blown away by what Marcu and Walt have achieved working off John Michael Greer’s excellent storytelling. See below for a sneak peek at the first page; trust me, you aren’t going to want to miss this one! Couple these stories with a tight and compelling letters section and an essay from Hannes Rollin on what the role of religion, superstition, and magic should be in deindustrial science fiction, and you have yourself one of the more fascinating issues of Into the Ruins yet brought to life. Subscribers have already received their copies. (Haven’t yet renewed your subscription? You can do that here or you can email me to find out if your subscription is still current and active.) Those of you who aren’t subscribers but would like a copy of the new issue can order a copy here from our store, which will ship immediately and is currently available with free U.S. shipping. The issue is also available from Amazon or you can purchase a digital edition of the issue at Payhip. For international readers, you can go to the issue page for links to international Amazon sites it’s available through. If you aren’t already a subscriber, consider signing up! The consistent support provided by subscriptions is critical to the success of Into the Ruins. And want some of our back issues? Don’t miss the special sale going on, in which all back issues are just $10 each and all orders currently ship free in the U.S.
As always, I encourage readers to send their thoughts and feedback to me at editor@intotheruins.com, both as casual emails (rambling acceptable!) and as official letters to the editor that I can consider for publication in the eleventh issue of Into the Ruins, scheduled for publication in November. In particular, I would love to receive thoughts and feedback in relation to Hannes Rollin’s essay. Comments for contributing authors, as well, will be happily forwarded on. P.S. Again, don’t miss our Fall Sale going on right now for a limited time! All back issues (#1-9) are just $10 each and ALL orders ship FREE in the U.S. Thanks! Into the Ruins: Spring 2018 (Issue #9) is Now Available! I’m pleased to announce that the ninth issue of Into the Ruins is shipping to subscribers and is now available for purchase! This Spring 2018 issue runs 106 pages, featuring six great new stories, as well as an Editor’s Introduction and the best (and longest!) letters to the editor section we’ve featured yet. Friends old and new emerge in this issue of Into the Ruins. Alistair Herbert returns with a follow up to his story “The Change Year” from the Winter 2018 issue, diving deeper into a future in which men and women alternate societal control every twenty-five years–and revealing the secret that created the system in the first place. Jeanne Labonte brings us a new tale featuring Bishop Matteo, taking him on an adventure of danger, intrigue, and justice amongst the Kazakhs. Rita Rippetoe, meanwhile, puts us back on the road to Finx, showing us this time how Pedro came to the Sanctuary. New friends step off the pages of this issue, too. A hospital administrator in a hard future learns new ways to practice medicine, but struggles to accept them. A man travels by sea toward Tiger Cave Temple, hoping to recreate a trip he took in his youth and finding the experience very different in a future in which travel is not so quick. Finally, we take a trip to the moon–only to find that our future space adventures are not going well. Whether it’s reacquainting yourself with old friends or meeting new ones, these stories aren’t to be missed. Subscribers should have already received their issues or will be receiving them in the coming days. Have you renewed your subscription yet? While many of you have, there are still quite a few who haven’t and therefore are yet to receive this new Spring 2018 issue; you can renew here to ensure you don’t miss this newest issue! Unsure if you need to renew? Email subscriptions@intotheruins.com and I’ll let you know the status of your subscription. Those of you who aren’t subscribers but would like a copy of the new issue, you can order a copy here from our store, which will ship immediately. The issue is also available from Amazon or you can purchase a digital edition of the issue at Payhip. For international readers, you can go to the issue page for links to international Amazon sites it’s available through. If you aren’t already a subscriber, consider signing up! The consistent support provided by subscriptions is critical to the success of Into the Ruins. As always, I encourage readers to send their thoughts and feedback to me at editor@intotheruins.com, both as casual emails (rambling acceptable!) and as official letters to the editor that I can consider for publication in the tenth issue of Into the Ruins, scheduled for publication in July. Let’s keep this issue’s excellent letters section rolling! Comments for contributing authors will be happily forwarded on. P.S. Into the Ruins: Year Two is now available for purchase! Similar to the Year One package, Year Two contains issues #5-8 and ships free anywhere in the U.S. for just $43. This is a great way to catch up or gift the magazine to a friend! Those interested in international orders should contact me directly at orders@intotheruins.com for more information. Thanks!